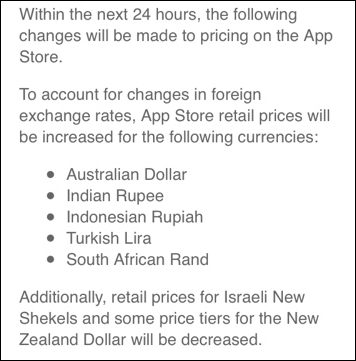 In reflection of alterations in exchange rates, Apple will be making subtle changes to its iTunes App Store pricing structure in several countries. For the most part, the modifications will prompt a trivial increase, although customers in Israel and New Zealand will benefit from an equally negligible reduction in price. 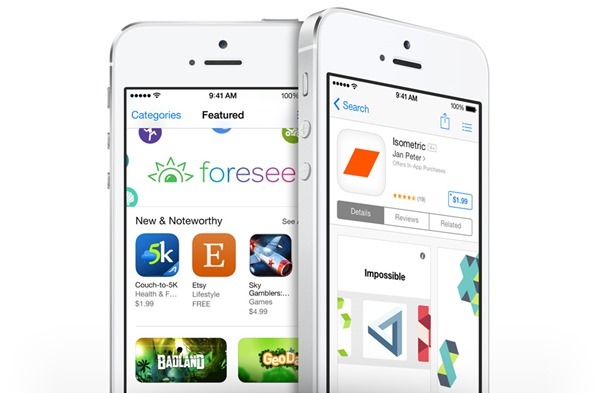 The App Store is the hub through which iPhone, iPad and iPod touch users can source new content, and over the years, has expanded to support dozens of nations and a bunch of different currencies. For the most part, consumers pay around the same amount, irrespective of where they may reside, but as the exchange rate fluctuates, the Cupertino has to make slight adjustments in reflection of any significant shifts in value. As such, during the course of the next 24 hours, the prices will rise for the Australian Dollar, Indian Rupee, Indonesian Rupiah, Turkish Lira and South African Rand. Meanwhile, Israeli New Shekels will be subject to a minor decrease, as will select price brackets for the New Zealand Dollar. Of the new changes, it’s those in New Zealand that will be the most happy. Not only is there a slight decrease in cost, but predominantly, apps tend to drop both there and in Australia before the rest of the world, and even when releases are simultaneous with the likes of the United States, the time zone difference means that those in NZ still get the latest and greatest a few hours quicker. Apple has come through with these kinds of changes on a number of occasions in the past, and tries to keep things as fair as possible for all of its consumers. Often, there are discrepancies, but with these latest tweaks to balance the books, everyone should now be on a relatively even playing field. I guess the real take-home from this is, if you happen to reside in Australia, India, Indonesia, Turkey or South Africa – and were planning an App Store binge in the very near future – then now would be as good a time as any to take the plunge and save a few pennies. Of course, since these are minor pricing adjustments, it’s not going to make the world of difference, but if you like to keep a tight grip on the purse-strings, then pick your next batch of apps up sooner rather than later!